KUANTAN: Wild freshwater patin and krai are scarce in Sungai Pahang, but patient anglers more often than not are lucky to land a catch. Cooked just right: Yaakob and Rohani showing the special patin dish available at his restaurant in Kuantan. Both of these species are expensive and fetch between RM80 to RM160 per kg. To bring out the flavour of these fish, a cook needs to use the right ingredients, and the cooks at Akob Patin House have mastered the art of cooking them. This eatery is located behind a row of buildings but foodies from near and far know about the mouthwatering patin and krai dishes offered here. In fact, the outlet which dishes out traditional Pahang cuisine is patronised by many locals and foreigners. In demand: The Gulai Ikan Patin Tempoyak, one of the specialties available at Akob Patin House. 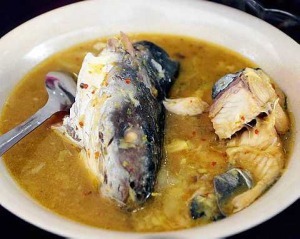 One of the local dishes here is Patin Tempoyak in which the fish is cooked with fermented durian resulting in a sour-sweet strong-smelling gravy. For the past five years, Akob Patin House operator Yaakob Ismail, fondly known as Pak Akob, 63, has been serving both types of fishes at his outlet in Jalan Besar. During lunch, between 11am to 3pm, the outlet is always full house. As there is great demand for his food, Pak Akob recently opened a second outlet here with a similar concept at Lorong Haji Abdul Rahman, off Jalan Mahkota. He manages the outlet with his wife Rohani Pilus, 57, and their children. “I have received feedback from customers that they enjoy our food very much. “Most of them are regular customers, and they encouraged me to open the second outlet,” he said. Recently, Pak Akob gave a dinner treat to his customers at the new outlet after its official opening by State Arts, Tourism, Heritage, Women and Community Development Committee chairman Datuk Shafik Fauzan Sharif. Pak Akob said he was fortunate to have a daily supply of fish to meet demand. What he gets depends on what the anglers provide, and this could sometimes be 30kg a day. “What’s important is that the supply is consistent, because the customers want a taste of patin and krai. “If I fail to get the fish, they will be disappointed,” he said, adding that he received supplies from Maran and Pekan districts. Pak Akob said the secret to his Patin Tempoyak was the right amount of chilli, fresh tumeric and tempoyak in the gravy. “I use only these three ingredients. It is a secret passed down from my great-great grandparents from Kuala Lipis,” he said. He sometimes has to source for the fish from rearers in Sungai Pahang if the stock of his regular suppliers was low. The price of wild patin could reach RM180 per fish. He sells two types of patin – patin buah (RM25 per kg) and normal patin (RM19 per kg), which are raised in floating cages in Sungai Pahang. As for the krai, Pak Akob said it cost up to RM150 per kg. “There is high demand for these fish and we cook up to 60kg of patin and fry 30 wild krai a day,” he said. His restaurant also serves rare traditional delicacies such as Gulai Asam Rong (sour vegetable soup with rubber seeds) and Sambal Hitam (chilli paste blended with boiled belimbing buluh). Pak Akob ventured into the food business by selling goreng pisang (banana fritters) here in the 1980s. In 1989, he opened the restaurant to serve authentic Pahang cuisine. He gets not less than 500 customers a day for lunch on work days and some 800 customers on public holidays. Meanwhile, Shafik Fauzan said, when it came to food, people did not mind spending extra. “In Kuantan, there are hundreds of restaurants serving seafood and freshwater fish as specialities. “The outlets are patronised by thousands of people at night because of these specialities,’’ he said, adding that Kampung Tanjung Lumpur was just one example of a seafood haven for tourists.